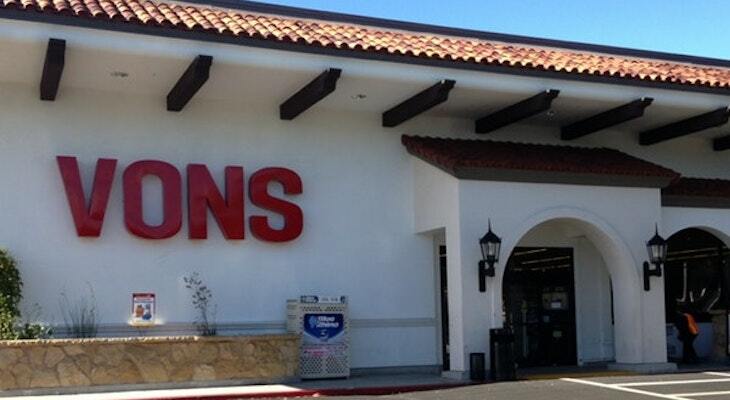 The Vons location in La Cumbre Plaza will close this September to make way for Bristol Farms, reports KEYT. Vons is scheduled to close on September 14 after 51 years in that location. Bristol Farms is described as an upscale grocery store chain that was founded in Los Angeles County. They currently operate fifteen stores with twelve being in Southern California and one in San Francisco. The company also owns the two Lazy Acres Market locations, one on the Mesa and another in Long Beach. Bristol Farms has not yet made an announcement on the store opening. The Vons at Turnpike/Hollister is wonderful. Lots of good choices, helpful manager, and many many gluten-free items. Try the gluten-free baguettes, fabulous, and reasonably priced. Doesn't Vons have a delivery service? With this Vons gone there is no more running out for milk really quick. Takes me between 13 to 15 minutes to get to Vons, longer to Ralph's depending on traffic. The other markets may be closer in time, but sadly I cannot afford to shop there. Back when they were advertising Grace Village they listed in the column for amenities that Bristol Farms was in walking distance as were bus routes and shopping at LaCumbre Plaza as well other places a person may find themselves needing. As you may know that housing project was made for low income and senior living. How are they supposed to shop there with very tight budgets? If you want something entertaining to read access their website. They forbid cars among other things. When we moved to Carpinteria the supermarket in Casitas Plaza was Jordanos, then it became Smith Food King, then Luckys, and finally Albertsons. I had been shopping at Vons in Montecito, knew the layout and friendly checkers so kept going there for awhile until I realized it was dumb to drive that far when we were 3 minutes from a perfectly good store with friendly employees, they were kept on as the store changed owners. It can just be hard to make changes of any kind. I've never been in any of the higher end stores mentioned here but they sound interesting and worth a try. Perhaps, like me, many shoppers have diverted to Smart & Final at La Cumbre and Grocery Outlet on De La Vina. Those two, plus Trader Joe's lessen my grocery bills. The staff at Von's AND Ralph's on Carrillo could not be more helpful or pleasant, but unfortunately the money determines my main shopping choices. Another over-priced high end grocery market that most of us will never shop at. Just what this town needs. Does anyone remember Smith's Food King? I recall they had decent quality at reasonable prices. Used to be several here in the 1970s and later. Now a division of Kroger. Yes, Smiths Food King was Jordano's. Von's was Safeway, Ralph's was Alpha Beta and Gelson's was A&P, Fazios and Albertson's so was Smith's Jordano's ? Sorry to learn of this, as there always seem to be quite a number of seniors who shop there. I bet BF won't be kind to their budgets. Gelson's is a lovely place to shop, apart from that atrocious tile floor. Rolling a cart around in Gelson's is an obnoxiously noisy shopping experience. Yes, tile floor the one negative. I always forgot that Vons existed. No complaints about BF, it serves a particular market and it's nice to have different places to go for high end produce/meat every now and then. I just wouldn't make it a daily place to get your staple (that's what TJs is for). On another note, I really don't get the love for Gelson's in this thread. IMO it's Vons quality for Whole Foods prices. Gelson's - VERY clean, great deli selection and hot carving station plus an excellent daily soup island. And, many competitive prices on things we buy regularly (watch for sales) coupled with the 20% off mailings you get when you sign up for email info. Overall good, sometimes great, value to me. The Von's at Turnpike/Hollister is the best one of any I've seen. As a side note, they carry many gluten-free products. During the holidays last year, I asked the manager about gluten-free pumpkin pies and he special ordered and put them out for everyone to get a chance at them. Great guy. Also, in the freezer section, there's a gf apple pie that you bake. Only about $7. And, they have gf baguettes in another area of the store. Produce excellent, including organic, top choices. Sadly, the big Albertson's merger mess coupled with the subsequent Haggen's fiasco caused the best Vons to vanish - Von's FAIRVIEW. By far the best Vons we've had here. We also like the Turnpike Vons. It is certainly not an 'exciting' shopping venture but mostly it is responsive to the customers and the produce and meat departments are solid and helpful. Only problem has been occasionally 'attitude' issues at the deli counter. Because of the location there is a large parking lot which is also nice, unlike Gelson's or other 'upscale' stores (especially TJs). Ugh. A decent store like Vons with properly hired employees and modest profit expectations is sold out to another image and exploitative merchandiser. I know that many in Montecito were apparently embarrassed to acknowledge that they shopped there but it will be missed. The many in Montectio that shop at Von’s do so at Von’s in Montectio which is not closing. Grocery Outlet in the Upper DelaVina shopping center offers some tremendous bargains. It’s not like Vons was so great but we don’t need another upscale grocery on upper State. I already don’t shop at Gelsons or Whole Foods because they’re so expensive, should I add Bristol Farms to that list too? Yes, BF is VERY expensive. You don't go there for value but if you want top-quality meat, poultry, and fish it's definitely a place to splurge. Trashy to who TOMTOM, elitist pigs like you? Smart & Final sells a lot of organic produce at very reasonable prices, also lots of organics in the freezer section. Too bad it's closing. I've always like their checkers and baggers. I agree with Monkeyboy that this particular Vons was really an underachiever, especially in that neighborhood close to Hope Ranch. I very rarely shopped there and, indeed, Redbox was the only good thing. As far as Bristol Farms, I really don't get it as we already have Gelson's with their great selection of produce, meat, and fish and, to a lessor degree, Whole Foods. Plus, I see Bristol Farms cannibalizing business from their own Lazy Acres, the latter being essentially a mini- Bristol Farms. I used to stop at BF when they had a store in Westlake on my way back from business in L.A. and the meat and fish selections were first class, although the produce section really wasn't anything to write home about. They also stocked a large selection of cheese, although too exotic for the most part. But at least that crummy La Cumbre Vons will be gone, although value seekers will now have to go elsewhere. They sell an incredible array of vegetables and meats. My "go to" value item at Bristol Farms is their $7.99 marinated rotisserie chicken, which is always tender a juicy. We can't wait to go shopping there because their employees are truly there to serve YOU! Another thing, b sure to try the baked goods if you want something "good" that goes with your coffee (or tea....lol). 9336: Working for Bristol p.r.? I will miss that Vons. So easy to park, great produce, and all the clerks are super nice. Hope the clerks get to keep their jobs. Let's start a pool on how long it takes before it becomes a Haggen's. LOL! Can't say I'll miss that gross Vons. Poorly stocked butcher items. Fresh chips boiled in grease so old they smell like old fish. There really is nothing that draws me there other than the redbox machine. Lazy Acres is not as upscale as Bristol Farms, nor is Gelson's. Whole Foods is simply lost somewhere in the shuffle. Trader Joe's better be paying attention. Pricey but wonderful food choices. Great deli and bakery, fresh organic produce. Gorgeous gift baskets. Shopping at Bristol Farms is an adventure. Free delivery to your home for orders over $99.99, or $9.99 delivery fee, same day if you order before 11 a.m. Hoorah! Good thing there is a lot of disposable income in that neck of the woods to support a Gelson's & and upscale Bristol Farms (aka Lazy Acres lite).